The game between Kansas and Kansas State will have all the excitement fans will expect to see. The only way Kansas State will win this game is if they can get Thomas Robinson in foul trouble early. With him in foul trouble K-State has the edge in the post. Expect Jamar Samuels to be attacking Robinson in the first couple of minutes to put pressure on him. Expect to see some pick in rolls to be used with whom ever Robinson is guarding to see if he can grab a foul 20 feet away from the rim. I expect Allen Fieldhouse to be extremely loud but that Kansas State will be ready for it. This will be the first time many viewers will see the speedy PG for KSU. Backcourt: Kansas has a more veteran backcourt, led by Tyshawn Taylor and Elijah Johnson. They are not as deep as Kansas State, but probably posses more talent. Kansas State’s backcourt is led by Will Spradling and Rodney McGruder. Although KU is prone to turning the ball over, I give the edge to them in this phase of the game. If Kansas State can force Taylor to cough up the ball more then 5 times expect Kansas State to get easy fast break baskets. Frontcourt: Kansas State is led by its only senior, Jamar Samuels, and Thomas Gipson. Coming off the bench is Jordan Henriquez. KU is led by All American candidate Thomas Robinson and 7 footer Jeff Withey. KU again has more talent, but Kansas State has much more depth. Bench: As stated before, K-State has much more depth than KU. Mostly with the big men because Kansas can not truly replace Robinson because of the rebounding dominance he creates. Coaching: Although Frank Martin will be giving his stair to nearly everyone in Allen Fieldhouse, he 0-4 in Allen Fieldhouse, so I am give the edge here to Bill Self. Coach Self always has his Jayhawks playing at an extremely high level at home. 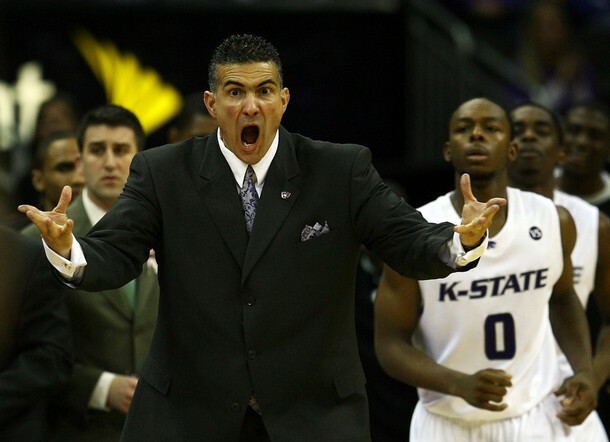 Prediction: KU is playing at home and is a 9.5 point favorite, but I like K-State’s depth to wear KU down with Frank Martin throwing a bunch of different defenses at KU to try to wear them down. Conner Teahan and Elijah Johnson have been in a recent shooting slump, don’t look for them to bounce out of it tonight with K-State’s tough defense. This entry was posted in Basketball, Home, Midwest, Uncategorized.